4 Types of Compressed Air Dryers | Compresstech Resources, Inc. If you have compressed air systems on your production line, you might need to invest in air dryers to match. Moisture in compressed air systems can lead to bacterial growth and corrosion, which may slow down processes and lead to breakdown of equipment. An aftercooler can remove most of the water vapor in compressed air, but depending on your application, the aftercooler by itself might not be enough. You’ll need to invest in a reliable compressed air dryer, choosing from 4 basic types available on the market today. To help you out, here’s an overview of these 4 classifications. Cycling – runs intermittently. These only power up to meet demands, helping minimize electricity costs. Non-Cycling – runs continuously. They can maintain a consistent dew point. Reaching dew points of around 36°F (2°C), this type of dryer is useful for general plant operations. It is not sufficient for systems that need extremely dry air or require temperatures below freezing point. Heated – 8% of the dried air is redirected to pass through a heater in the dryer’s circuit. This hot, dry air removes moisture from the desiccant before being discharged. Heatless – 15% of the dried air is diverted to the regenerative tower. It expands and pulls water off the desiccant with the help of heat, a byproduct of the adsorption process. The moist air is then discharged. Desiccant air dryers are suitable for applications that involve subfreezing temperatures or require extremely dry air. They are capable of maintaining consistent dew points of -40°F/°C or less. Paired with a regenerative desiccant dryer near the point-of-use, they can reach dew points of -100°F (-73°C). These air dryers are filled with membrane microtubes in a bundle. The microtubes’ material only allow water vapor to pass through while trapping oxygen and nitrogen molecules. As a result, only dry air remains in the tubes and exits the dryer. If you have a production line in a remote location, consider investing in membrane air dryers. They have no moving parts and do not need an electrical supply to operate. They also require little maintenance and can survive explosive environments. On top of that, they can achieve dew points as low as -40°F/°C. A deliquescent air dryer passes compressed air over beds of chemicals, such as calcium chloride and lithium chloride. These chemicals absorb the water vapor and are later discarded once they become saturated. A coalescing filter can help extend the lifespan of the chemicals by preventing liquid water from entering the dryer. You’ll also need a particle removal filter to keep chemical particles from being carried downstream by the passing dried air. Deliquescent air dryers can achieve dew point suppression of 20ºF to 25ºF (-6.6°C to -3.8°C) below the initial temperature of the compressed air. 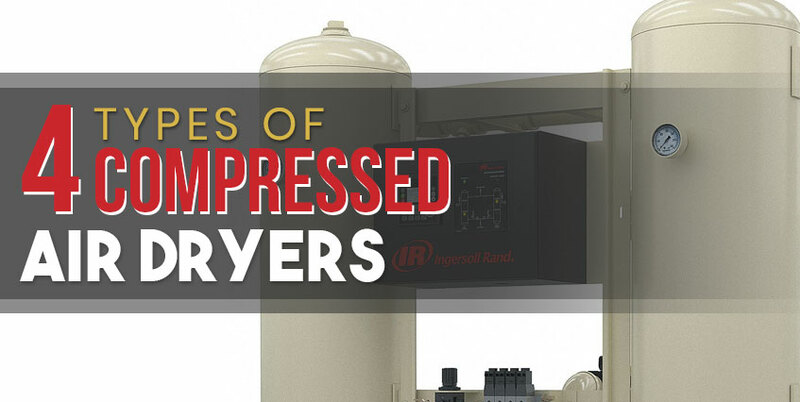 With this overview of the 4 types of dryers, you can have an idea of what equipment you’ll need next for your compressed air system. It’s best to invest in an air dryer from a world-class manufacturer to get the most out of your investment. Why not go over the products offered at Compresstech Resources, Inc.? Not only can we introduce you to the best air dryers available in the Philippine market, but we can provide you with expert insight to make the most of your production line. Contact us today! Read more articles about air dryers and air compressors by visiting our blog regularly.